Weekly Shonen Jump is Japan’s most successful manga magazine, something that’s been true, excluding a brief early-aughts blip, for upwards of 20 years. But the brand didn’t get there by some fluke – it earned notability by harnessing a number of talented artists in many eras; Go Nagai in the late 60s, Buichi Terasawa and Osamu Akimoto in the 70s, Hirohiko Araki, Masami Kurumada, and countless others in the 80s. But that doesn’t mean the past 2 decades were free of uncertainty or bad luck for Shueisha. In actuality, in between the early-nineties peak where the magazine’s circulation topped 6 million copies and the modern era of Oda Eiichiro breaking his own volumes’ records on a regular basis, they experienced one of the biggest misfortunes that can befall a publishing empire: two franchise cornerstone series ending withing 13 months of each other. Remember that 6 million copy circulation figure I mentioned? It died with Dragonball; circulation figures dipped below 6 million in 1996, the first year of non-Dragonball Jump. The next year, following the somewhat-abrupt ending of Takehiko Inoue’s Slam Dunk, circulation dropped to a little over 4 million copies. That’s a pretty harsh 2 years. Fortunately, 1997 also saw the release of what would become the greatest-selling manga of all-time, One Piece, but the series took time to become a juggernaut – it had only 130 million copies out as recently 2007, so more than half of its current 300 million total was amassed in the past 7 years. The presence of a younger One Piece and less-ersatz Hunter x Hunter wasn’t enough to prevent chief competitor Weekly Shonen Magazine from overtaking WSJ in circulation totals for the duration of the Shaqkobe three-peat in the early 2000s. Losing A-list series hurts regardless of what you do, but that hurt gets magnified when it was the only series in its class you had. Ultimately, there are two superstar-related questions that a publisher needs to be able to answer adequately. One, what’s your franchise today? Two, what’s your franchise in 5 years? If you can only answer the first one, you might be in trouble when the second question becomes the first. Shueisha has been very good at addressing this issue, aggressively cancelling younger WSJ series that don’t look like they have the potential to be megahits in favor of newer ones that might. That’s smart. They have a 10-year or so window in which One Piece will continue to run, and they’ve positioned themselves to be able to soften the blow of its eventual ending with something, at least. 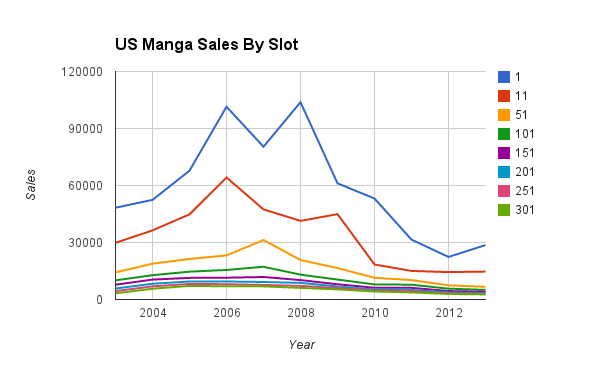 In 2007, around the time One Piece was reaching its 40s volume-wise, manga in the US was booming. Buoyed by a combination of Naruto, Death Note, Fruits Basket, and Bleach, four series keeping the manga top 10 list occupied between them, the market was having its best year to date. But the peak it hit that year was a very transient one; while Naruto’s 28th volume, released in March of 2008, would break sales records, the rest of the market was not so lucky. Lowball bookscan figures estimate the industry lost about $8 million in revenue that year, a harbinger of harsher times to come (a $20 million additional decline from 2008 to 2009, for one). That’s a key factor in what ended up as the long-term future of US manga market in the mid-aughts; that it relied on a couple of hits and was unable to replace them when they ended, because the tier-2 market had slipped away by the time they were over. Arguably, if the bottom of the market had been more robust, it’s reasonably possible more than just one volume of Sailor Moon could have broken 20k in 2012. Viz and co didn’t really have as much to work with as they could have in a better era courtesy of the financial crisis slamming the window shut on them at the conflux of Naruto’s popularity peak and the last hurrahs of shorter-lived hits. Note: Some of that decline may be due to the industry’s increased digital presence as well. It’s worth mentioning, though it’d be dubious at best to say it accounted for the majority of the shift. What follows is some commentary on the anime industry based on what’s been happening in 2014 to date. The year is still not over and a lot of things could happen between now and December. Be cautious and draw firm conclusions from current data only after it’s held steady for a while! Naruto isn’t the most recent series to achieve record-breaking numbers in an industry with a potentially reeling upper-middle class. The first volume of Love Live’s second season, which aired this spring, set a record as the best-selling volume 1 of an anime ever. Meanwhile, other 10k+ hits have been relatively hard to come by in 2014. Hoozuki no Reitetsu was the only one to come out of Winter, and Spring produced 2 from sequels (LL and likely Stardust Crusaders) and one new face (Haikyu). Counting sequels/reboots of 20k+ franchises from this Summer and Fall, there are 4 more fairly likely candidates to make the list (SAO, Fate, Free, and P4GA in descending order of certainty). Excluding a ridiculous 2011, there have been somewhere between 4 and 7 non-sequels shows hitting 10k+ averages each year of the BD era, in years that contained roughly 120 shows (roughly 30/season). Assuming roughly 30 shows each in Summer and Fall have 5-7% odds of hitting 10k, we’d expect ‘the field’, consisting of shows with less obvious pedigrees, to contribute 2-3.5 10k+ shows. All things considered, the odds of reaching 10 total 10k+ hits this year could probably be a lot worse. A lot of potential variables are still in flux, and a lot of Summer shows may be overestimated by the naive odds, but such a value would not be out of keeping with the total for 2013 (where Kill La Kill locked up the 12th slot very recently). But there’s another narrative here that I’m more worried about. Every year in the BD era has had a 10k+ count helped, to some degree by the inclusion of sequel series. 2011, with its startling 11 10k+ new series, had 4 sequels pumping up the numbers, and others had between 5-7 sequels. A year’s 10k+ count is really a function of both the success of new shows that year and the success of other new shows in the previous 2 years. So if the field underperforms and only one other show joins Hoozuki and Haikyu as the only original 10k+ series this year, that somewhat limits the amount of sequels the industry can put out with easy odds of padding out the tally. And, in the long run, the amount of profit that companies can invest back into new series with industry-average odds of becoming a hit. If upwards of 90% of anime are forgettable not-hits anyway, and making fewer projects with more resources ups both the rate and degree of success for any given series, why doesn’t the industry just make 50 high-budget series a year instead of a larger number of lower-odds ones? 1. For one, there are diminishing returns involved in production. While economic freedom can definitely be a huge boon to a production, there are some problems that can’t be solved with a big budget. 2. For another, there are lots of people who would rather get a chance to lead a B-grade project (and get paid like a leader get paid) than work as a grunt on an A-plus one. And fans who would prefer a B-tier show in one genre to an A-tier show in another. 3. But another reason, the one I keep coming back to, is the reduced risk that comes with larger numbers. If you could combine the resources of two shows into a single project, you wind up also increasing the number of ways that you end up unable to sustain your business model. Every series has some small degree of 10k+ upside. One failed series can be dealt with if it’s one out of 10 projects and the others perform at an average level. One failed series out of 5 total projects is a much bigger blow. Good management is about maximizing gains, yes, but it’s also about finding ways to avoid taking on unnecessary risk, and one of the simplest ways to avoid risk is to diversify your offerings. Incredibly successful franchises are, well, incredibly successful franchises and should be respected as such. But the presence of such franchises isn’t the only indicator of industry health. No franchise lasts forever, and how effectively people use those profits to mine for new talent and possibilities is what determines who survives in the long haul. That’s why I worry a microscopic bit about a year when the sales record for volume 1 of a TV anime has been broken – because of the finite odds that this year will end up with a 10k disk average tally less than last year’s total, and thin in new faces. I’m rooting for success in Fall especially hard this year for that reason; I don’t really want to see the kind of reduction in production and diversity a shrinking upper-middle class could bring. Even the worst-case realistic scenario where the field produces zero new hits through the rest of the year is nowhere remotely close to a doomsday scenario, but it would likely mean an industry that had a little less room to gamble some of its budget on interesting calculated risks. This entry was posted in Articles, Fun With Numbers and tagged Anime, Death Note, Dragon Ball, Fruits Basket, Fun With Numbers, Love Live, Manga, Naruto, Shueisha, Weekly Shonen Jump by torisunanohokori. Bookmark the permalink. 10k isn’t some magic number, though. Spring had a lot of series that will probably end up averaging marginally below the 10k sales line – GochiUsa, Mekakucity Actors and Mahouka all passed 10k sales for volume 1, and none of them with big sales drops. No Game No Life and Sidonia also both got >9k first volumes..None of these series will average over 10k sales, but all five (all of which are the first anime series in their respective franchises) will get very strong sales figures nonetheless. 10k isn’t a magic number, true. But it’s not like the next tier has been notably better than in previous years to compensate (which would be the first thing to look for). 2013 had 7 shows in the 7k-10k range, and 2012 had 15. If all of the shows you mentioned end up in the 7k+ range and Kamigami no Asobi shows any kind of event ticket drop, that’s 5 total for the year at the halfway mark; not notably better than recent totals for years that had 12 10k+ shows. Some of them will probably (and hopefully) still get sequels, but they will be more modest successes than if they had sold more in season 1. I’m not trying to seem overly alarmist here, but there is reason to say the year has underperformed to date (especially since the LNs Mahouka and Mekaku were adapted from were crazy-popular and they had real preseason chances of breaking 20k).